One thing I wanted to do this week was go outside my comfort zone as far as anime is concerned. I tend to stick with comedies, or romantic-comedies, or maybe some drama or slice-of-life genres. One genre I do not really care for or pay attention to is mecha. I will go more in to that in a future entry, but the only series I own that has to do with mecha would be Full Metal Panic, though the series does not completely focus on that. I have tried other mecha series over the years: Vandred, Gurren Lagann, One series where I remember one of the words was Zwei, I think. None of them appealed to me nor kept my attention. However, over the couple of years of research, one series was brought up continually and was hotly debated by its fans: Evangelion. Instead of spending money on an entire series that I may or may not watch or enjoy, I decided to get the first of four movies that are expected to come out. The first two, You Are (Not) Alone, and You Can (Not) Advance, are both praised by critics and fans the world over, so I decided to grab a copy of You Are (Not) Alone (Hereafter called 1.11 because its easier to type) and give it a whirl. This is by no means a review and please do not spoil me. I am just going to post some thoughts on the movie and how the movie made me, or perhaps not made me feel. Also, I may not get some facts straight. The movie is constantly going forward and there was a LOT of information to be poured into an 80 minute movie, so I am still confused on some points, but again, this is not a review, just my impressions. I'll admit, this Angel was pretty cool. First off, despite the movie having some neat fighting scenes, the movie still didn't cause me to change my mind about the mecha genre. I'm sorry, but especially the "deployment" portions and the usual "unit has taken damage" sequences, I just felt like I was watching any other mecha show. I already have one, it's called Full Metal Panic. In fact, there were a few similarities. I realize Full Metal Panic came after Evangelion and probably borrowed some elements, but to me it has the same tropes as any other mecha anime. The pilot has mental issues. He comes in near death several times. He has to use a special weapon to defeat his enemy. They destroy half the battlefield. Again, I realize that this will tick some people off, but the battle scenes are just too overdone in the entire genre, and Evangelion is no exception. The story behind it was confusing, as expected. A lot of questions were raised and few were answered, and out of those few, most just created more questions. Unlike other series like Durarara and Eden of the East, I really didn't feel compelled for the show to answer these. Its sci-fi, which is another genre I don't care for. You can create a powerful, grotesque, creature, but come up with some deus-ex-machina that can defeat it, or if the hero is in trouble, just make some random crap up that gets them out of the pickle. It reminds me of a Voltaire song. I can see where the multiple interpretations come in, though. There are a LOT of references to Christianity, Jewish history, and so forth. The imagery is more prevalent that it was in Death Note. I also can see how different people can see the series in different ways. I mean how many series can you honestly say are open to as much interpretation than Evangelion? 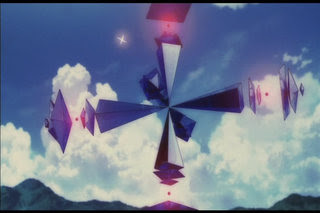 I don't even think Lost was as bad as Evangelion is. I could see how people could spend hours dissecting every last detail in the movies and come to other conclusions. 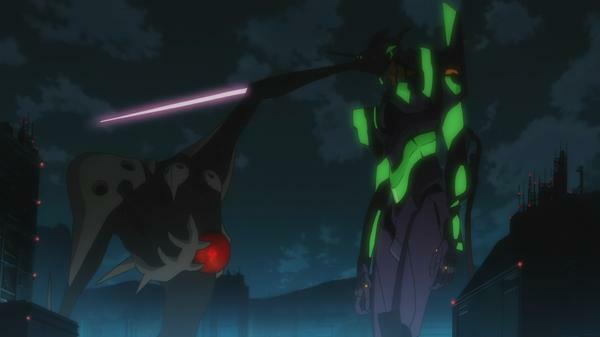 I think that is really fascinating and Evangelion deserves major props for that. I can be normal! I can be normal! I can be normal! I can be normal! I can be normal! The characters are...well, I think every single main character either needs professional help in some fashion. 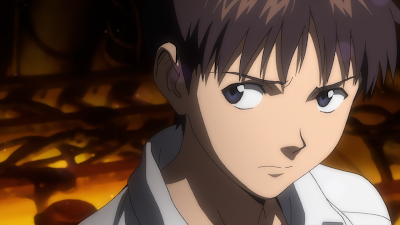 At first Shinji seems like a typical kid, but the further the movie was rolling, the more he seemed mentally unstable. He has his moments, but mostly he is being thrust into an overwhelming situation and seems to be declining into a downward spiral. 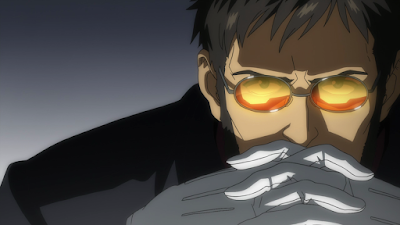 His father, Gendo, is equally disturbed, in my opinion. I mean he is probably one of the worst anime parents I have seen in any series, so far. He just seems manipulative and heartless. I'm sure there are other facets to him that haven't been shown yet, but he stands alone. I could talk about all the characters in detail if I wanted to, but they all are complex, kind of wrong in the head, but are watchable. It is like watching a pirate ship in a stormy sea with extremely loose cannons. You have no idea what to expect from them. Father of the year! Ha ha, I kid. Overall, I can see me going and watching the other movies when they come out, but for me Evangelion is a mixed bag with some mediocre action mixed with intense, but confusing and unpredictable story and characters. I can see why it has such a huge following and I can understand what all the ruckus is about with the community. Honestly, I think I'll try to watch the other movies when they come out. I will watch 2.22 the next time it is on sale or when it is convenient for me to get it (In other words, not right away), and the others if 2.22 can keep my attention. I am not sure I could stand watching a 26 episode series, but I will try to give the movies a chance. So there are my impressions of the movie. What did you think about the movie/series? If you do comment, please, no spoilers!